Major commissions, prizes, exhibitions and other notable events. For more information on all topics, please visit my website. Dancing Wave, kinetic installation, 7 November, Technology and Emotions Conference, Norwegian University of Science and Technology, Oslo, Norway. An Alternative Approach to Unifying String Theory with the Standard Model of Particles, installation created for Tallinn Light Biennale, 24 Nov..1 Dec. multiple kinetic sculptures and artist designed chromastrobic lighting, 6 m tall x 10 x 10 m.
Made in Light, touring group show organised by Musee en Herbe with exhibitions at Vasarely Foundation, Aix en Provence, EDF Foundation, Paris, Christie's Paris. Spinning Cosmos, Art Futura, MUMI, Montevideo, Uruguay, 7..17 November, light installation, multiple kinetic sculptures and artist designed projections, 3 m tall x 6 x 6 m.
Persistence of Vision, Origin of String Theory, Light Show, Phaeno Science Centre, Wolfsburg, Germany, opened 28 September for one year. Enigma of Light II, Latymer Upper School, London, permanent installation of wall mounted relief outside physics department in new science building, 1.2 m tall x 2 m wide. Persistence of Vision, Art Futura XXI, Bilbao Spain, 14 July – 18 September, interactive light sculpture, 4 m tall x 1 m diameter. Wave Trio, Kopernicus Centre, Warsaw, Poland, new science museum, opening early autumn. permanent installation of three light sculptures, each piece 4 m tall x 1 m diameter each. String Theory II, Anchorage Museum at Rasmuson Center, Anchorage, Alaska, new exhibition opening May. permanent installation of light sculpture, 7 m tall x 1.7 m diameter. 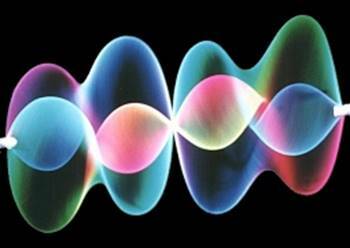 String Waves, Museum of Science and Industry, Chicago, new exhibition opening March 18th. permanent installation of light sculpture, 9 m tall x 2.4 m diameter. Entanglement I, Kinetica, art fair, London, 4 – 7 February, light sculpture, 3.5 m tall x 0.6 diameter. Entanglement II, ARC 2010, London, 3-5 February, light sculpture, 3.5 m tall x 0.6 diameter. All white version of The Wave. City Gate, Shortlisted for Spitalfields Sculpture Prize, Exhibition of maquettes by shortlisted artists, 12 January – 12 February. The Light Tree, Tower Hamlets, London. Permanent outdoor light sculpture, design commissioned, cancelled owing to budget problems. Light Wave, Casa Décor, Madrid, 7 May – 7 June, light sculpture, 5 m tall x 0.6 diameter. Abstract Cosmology, Jerusalem Festival of Light. Jerusalem Archaeological Park, Israel, 10 – 16 June. outdoor installation, 3 sculptures 6 m tall in area 6 x 6 m, video projections. Timeless Universe, Via Festival, Le Manege, Maubeuge, France, 13 – 23 March. smaller version of installation previously shown at Sala Parpallo, Valencia, Mixed media, 6 kinetic sculptures approximately 2 m tall x 1m diameter, 1 sculpture, 6 m tall x 2.5 m diameter. Timeless Universe, Exit Festival, Maisons des Arts, Creteil, Paris, 28 March - 6 April. same show as described above. Souls and Machines Exhibition, Museo Nacional Centro de Arte Reina Sofia, Madrid, 26 June – 13 October. 4 new works: Spinors: group of 8 kinetics, 1.5 x 1.5 x 0.75 m; Enigma of Light, wall relief 2.4 x 1.2 m; Wave Function, kinetic sculpture 1.5 x 0.75 x 0.75 m; Abstract Cosmology, group of 3 kinetics 6 x 2 diameter, 6 x 2 diameter, 4 x 1 diameter, mixed media, various forms of light projection. The Gate of Time, Milan Design Week, 1 – 10 April, outdoor installation: the largest work so far created. Mixed media, 15 m tall x 2.5 m diameter, Porta Ticenese. Timeless Universe, Sala Parpallo, Valencia, Spain, 17 May – 9 July. One man-show, two sections of retrospective work and a new installation. Entire gallery painted black. The most comprehensive exhibition to date, 29 exhibits, mixed media, light projections, largest individual work shown 6 m tall x 2.2 m in diameter. A conference was arranged with the show on the subject Time Does Not Exist. Conference speakers included the noted English physicist, Julian Barbour and myself. A catalogue of the show has been published. String Theory, Wolfsburg Science Centre, Germany opened 29 November. Permanent installation. Mixed media, light projections, 7.5m tall x 1m in diameter. Waterlow Park, London, 22, 23 September. Installation as part of a special event organized by the charity Garden Africa. Group of light sculptures, 3 m tall x 0.6 diameter. 46th International Film Festival, Thesaloniki, Greece, 17 – 28 November. Installation of light art, mixed media. 6 suspended light sculptures, various heights 2 – 3 m.
Feria, in Gijon, northern Spain, 1 –15 August. Installation of light art, mixed media fully blacked out space 6 m tall x 8 x 12. CanariaMediaFest, Las Palmas, Gran Canaria, 23 – 30 October. Installation of light art, mixed media, fully blacked out space 3.5 m tall x 6 x 6. Chromatoforms, October Gallery, London, opened 4 November. opened to coincide with the 25th anniversary festival for this gallery and eco-culture. Light installation, mixed media, 4 metres tall x 2 x 6. Kinetic Art Organization Prize winner. 10 August. The Kinetic Art Organization (KAO) was founded as a not for profit organization by a group of kinetic artists. There are KAO members in over 60 Countries. They are the largest Kinetic Art and Sculpture Organization in the world. Arenas Movedizas Festival, Gijon, northern Spain, 20 – 28 September. A culture festival mostly featuring digital works by Spanish young artists. The installation was in a chapel by the waterfront that is more than 300 year old. It has been converted to an art museum. Installation of light art, mixed media, fully blacked out space 9 metres tall x 8 x 16 m.
Left bank of the Seine, Paris, 23 June. Installation to celebrate the re-inauguration of a major kinetic sculpture by Nicholas Schoffer. This extraordinary work is more than 10 metres high and is situated in a park by the Seine. The event was to mark the moment it was switched back on after many years of lying idle, following attack by vandals. Kinetic Art Organization Prize winner, 20 June. Sonic Light, Paradiso, Amsterdam 13 – 23 February. The Sonic Light conference and festival chose visual music as it themes in 2003 and invited a large number of artist and composers in the field to participate. Art Futura 2002, Contemporary Culture Centre, Barcelona, 31 October – 3 November. Art Futura is one of the worlds leading showcases for digital art, held annually in Spain. This festival was founded in 1991 and has been presented every year since. Three new works were created for the show, The Wave Equation 5.5 m tall x 12 x 2, The Suspended Wave 2 and the Hyper Spheres. The Suspended Wave is an outdoor piece that was hung from the 30 metre high roof in the courtyard of the CCCB. Resonant Wave Festival Spannwerk, Berlin, 25 May – 8 June. This international festival brought together visual and performing artists from USA, Israel, UK and Germany. The new light sculpture, Manifold Wave was suspended from the 15 m high ceiling of the main transformer hall in this converted power station. Singapore Science Centre, October 2001 – January 2002. One Man Show, 7 suspended light sculptures hung from the 25 m high ceiling of the large central atrium and exhibition space, shown here for the first time. The exhibition also includes a retrospective selection of smaller works. Many of the works including the largest piece, the 10 m tall Floating Wave were subsequently purchased by the Science Centre and are now in their permanent collection. Exit Festival, Maisons des Arts, Creteil, Paris, 6 – 18 March. Major exhibitor to this large international festival of performing and visual arts. Pieces on show included a retrospective of works since 1981. The most recent work, Wave Factory is 9 m tall. Via Festival, Le Manege, Maubeuge, 30 March – 7 April. The Exit Festival was taken on tour to northern France. Satellite Media Services company HQ, UK, opened 1 August. Commission for permanent installation, 4.6 m high light sculpture in the entrance to the new building. Nutopia, Britain’s first cyberlounge, Covent Garden, London, 2 January - 31 December. Light Waves III, kinetic light sculpture, 2.5 m tall x 1.5 diameter. New Art gallery, Walsall, November. Opening of major new art gallery which commissioned one of my pieces for permanent display, see below for details. for inter:face, a festival organised by Digital Summer in Manchester, 13 – 22 October. The Wave Factory, Installation of light art, mixed media, 7 x 6 x 6 m.
Commission for the construction of a Nambu, an interactive light sculpture for the New Art Gallery, Walsall. mixed media, 2.5 x 2 m diameter. Receive the Ushio America Award for Innovation, 16 April. Winner of Lightforms ’98, international competition organised by ASCI for creation of site specific interactive lightforms on a monumental scale. New York Hall of Science, 16 April - 31 May. Dark Matter, 8 m tall x 2.5 m diameter. Commission to design and manufacture 3D scanner prototype for Tom DeWitt, American video artist and inventor 1 – 30 April. Co-invent 'Megamouse' with my son, Jack, the mouse so large you have to sit on it and push it round with your feet. Performance with Jack featuring Megamouse and other light works at Technorama, Switzerland’s leading science museum. Author of Zip Art software for graphics and animation, a unique, powerful and fun approach to computer graphics. Mathematical algorithms from Chaos theory have been used to generate stunning imagery, but these take a long time to render. Zip Art algorithms can be computed in real time. A user with minimal drawing skills can create beautiful images with a choice of hundreds of fractal like drawing tools. Commission for two nine foot high interactive light sculptures commissioned for 'Energy and Movement' by Mercedes Benz for hands on exhibition touring throughout Germany. 4th International Biennial in Nagoya ARTEC'95, Japan, 28 April – 25 June. Recommendatory Prize for the work Light Waves. Art Museum, Walsall, England. 23 September – 5 November. One man show. Technorama, Switzerland’s leading science museum. Commission for Light Spinner, Permanent Installation: touch screen controlled interactive 4m high light sculpture. Art Museum, Walsall, England. Group Show of Light Art in the town museum, a place known for its annual Light Spectacular. Technorama, Switzerland. Group show: Lichtspielereien, various small works. Economist's Plaza, London February. Collaborative piece with Danny Lane, We made a work together, Northern Light, a sand blasted glass construction like a sail onto which I projected chromatic light. 6 x 20 x 4 m high. Images du Futur, Montreal, Canada. Three kinetics: The Big String 6 m x 2 diameter, Optic Nerve, 2 x 2 diameter, Northern Light II, projection work 1.8 x 6 m.
BT Head Office, Art in the City, London, 1 July – 30 September. 7 m tall fibre optic sculpture, situated in a 100 foot high Atrium window close to St Paul's Cathedral. Mixed career working as a Lighting designer, mainly in avant-garde music concerts and theatre shows, some commercial designs leading to licence agreements along with earlier exhibitions of visual art. Issue commercial licence in USA for 'Light Guide Lamp'. Issue commercial licences in UK and USA for 'Optic Nerve'. Appearance of 'String Ray' on BBC 1 "Tomorrow's World". Appearance on BBC 2 "The Late Show". Attend and lecture, Arttransition '90, Centre for Advanced Visual Studies, MIT, Cambridge, USA. Exhibition: The Young Unknowns, London. Electric Angels, Slaughterhouse Gallery, London. First Installation of spinning strings light sculptures illuminated with chromastrobic light. Lighting director for the Electro-Acoustic Music Association of Great Britain. Concerts held at: Place Theatre, October Gallery, The Royal College of Music, The Almeida Theatre, Queen Elizabeth Hall. Performers include Roger Smalley, Stephen Montague, Vocem, Metanoia, Francis Monkman and Steve Reich. Lighting director for Man Jumping, Queen Elizabeth Hall. Lighting director for The Electric Symphony Orchestra. Concerts held at: Corn Exchange, Cambridge, Bloomsbury Theatre, Queen Elizabeth Hall, Sadler's Wells Theatre. Soloists include Francis Monkman and Terry Riley. Exhibition Event, first public show of light sculptures illuminated by chromastrobic light, ICA, London. Lighting director for John Cooper-Clarke, U.K. tour. Special effects director , Oval House Theatre, London. Lighting director for Ken Campbell's 'The Warp', Edinburgh Festival Fringe & The Round House, London. Open Studio exhibition, Space Studios, Lewisham, London. Lighting director for Notting Hill Carnival. Stage & Lighting designer for Bristol Revunions, Edinburgh Festival Fringe. Stage & Lighting designer for: Morphic Dance Co. Gulbenkian Foundation sponsored stage play, Crediton Community Centre, Devon. South Western Arts Association sponsored touring exhibition. Educated, Cambridgeshire High School for Boys. Sussex University, School of Maths & Physical Sciences. Graduated with BSc Hons. Exeter College of Art, Faculty of Fine art, Sound & Light Dept. Graduated with BA Hons.